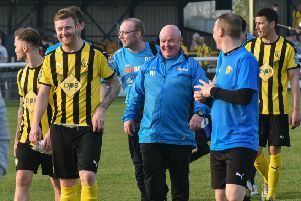 Leamington boss Paul Holleran has praised his side’s second-half performance at home to Redditch on Tuesday evening, calling it their “most pleasing 45 minutes of the season”. After exiting the FA Cup at Highgate and throwing away two points by conceding a late equaliser to Weymouth last Saturday, the misery looked set to continue as Brakes found themselves trailing to a second-minute Danico Johnson header. However, the hosts went on to dominate the second half, clinching all three points in the 82nd minute after Rob Thompson-Brown’s corner was bundled into the net by a combination of Jamie Hood, Darren Pond and defender Jordan Jones. “It was probably our most pleasing 45 minutes of the season, especially after the disappointment of our last two games, losing at Highgate and then the late goal against Weymouth,” said Holleran. “And after the first-half performance, the pressure builds. “But we showed a lot of character. We were brave with the ball and off the ball and we played some good football. Holleran admitted the introduction of Richard Taundry from the bench had a major bearing in Brakes’ fightback, with the former Walsall man providing some much-needed guile as Redditch retreated to try and protect their lead. “Redditch played 5-4-1 and dropped off when they didn’t have the ball and we fell into the trap first half. “We went too long too quickly and the players without the ball didn’t work hard enough to find the pockets of space. “But in the second half we tinkered with the formation and we passed through the line. Instead of just going from A to B we went from A to B to C to D.
“And as they got deeper and deeper it was ideal for Richard. “He has a little bit of time, draws people out and picks the right pass. Holleran’s delight at the second-half performance against Redditch was tinged with the disappointment of having seen Weymouth deny Brakes a home maximum three days earlier. The two points dropped would have seen Leamington sitting joint top of the Southern Premier League and Holleran says his side must be more ruthless when in control of games. “The level of performance in the first hour was where it needed to be but we didn’t put them to bed. “They had good players coming on and they won’t be far away when they serious business starts. “The last 15 minutes they took risks. “The did open us up with a good piece of play beforehand but the goal was poor. Leamington now face a ten-day break before their next game, resuming their league campaign with a trip to St Ives Town a week tomorrow. And while Holleran will look on with envy as many of their rivals fight it out in the FA Cup, he says a chance to catch breath will have some benefits. “We’d love to be in the FA Cup, but we’ve had something like ten games in a month and we’ve picked up a few niggles and knocks. “James Mace has a tight groin and Tom James has a tight hamstring. “I’d rather play Saturday but it gives us a chance to rest a few players, treat a few players and go again.